Mapopolis has made a big name for themselves in the US where they've created a GPS navigation product that is cheap, affordable for all GPS Users and by keeping the application simple they've managed to make great strides in features they offer with their products. 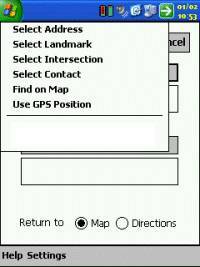 This has seen many American users going for Mapopolis because you only use the maps you require, they're downloadable direct from the Mapopolis website making updates a breeze, and their support model rivals most of the top GPS companies offering quick turnarounds on bug fixes and updates. Mapopolis offer their Navigation program for free, and you only then pay for the maps you wish to use. 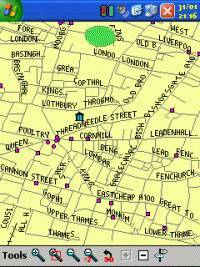 Downloading Mapopolis maps are easy, once you have created an account on their website and entered your credit card details, you can download any of the maps under the headings that Mapopolis provide. The great option here, is Mapopolis give you everything from the most basic of features, eg Streets, landmarks, GPS Support right up to Navigator which gives you dynamic door-to-door navigation with voice prompting, including all Platinum features. This allows you to pick and choose not only the best maps for your situation, but also the best product set. Not everyone necessarily requires the full monty, and it's good to see that Mapopolis have given their customers the option of choosing rather than being dictated to. 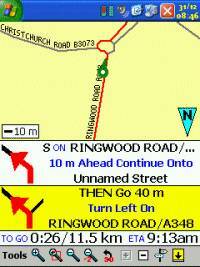 For the purpose of this review, we have reviewed the FULL UK maps which are listed under the Navigator product set. When you go to purchase a map set, you'll be given the opportunity of purchasing each map by country. The complete map pack for Europe (Release 4) costs $99.95 for a one year usage. 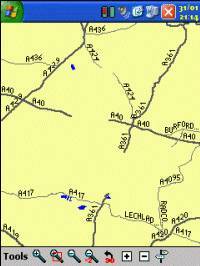 If you want to download singular maps from the Platinum Plus GPS package, you can purchase each county map at $12.95 per map. One thing Mapopolis has attempted to do is keep things simple. This has paid off in a number of ways. You don't get confused where any of the options are within Navigator, it also runs extremely fast, putting it through the test I have seen no slow downs within the application at all. Map rotating and zooming is extremely fast, much faster than any other product on the market today. This maybe partly due to the maps, although Mapopolis have tried to get as much detail onto the Platinum maps, they've tried not to go overboard, so roads do look like lines rather than roads, but this makes the application run very fast and also gives quicker routing. 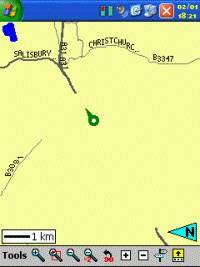 As you'll see from the GPS Status screen below, everything that's needed eg Speed, Altitude, Heading and Range are all included with a compass. 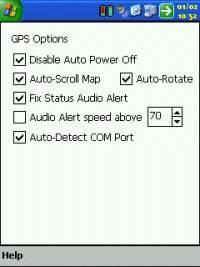 Mapopolis have also added in a manual COM port configuration option, and to allow Navigator to auto-detect your GPS Receiver. 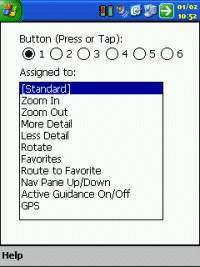 This is a feature that should be added to all GPS products by default, yet we do still find some newer products on the market not having this feature, so I'm glad to report that Mapopolis have thought through the most basic of features and added these to Mapopolis Navigator. The Map screen again shows great thought. 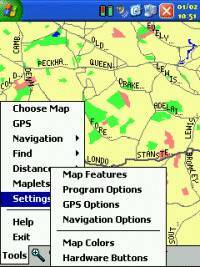 In GPS applications where we see county or city maps, we've always had the problem of having to choose between maps, and not be able to map stitch. Something Mapopolis has achieved is to not only allow for seamless map stitching, but to also give you the option of selecting multiple maps, or even better to allow to open all contiguous maps, so if you have one or more maps, Navigator will open each map when required (and you won't see this happening it will be accomplished in the background), and the maps will automatically be stitched together. 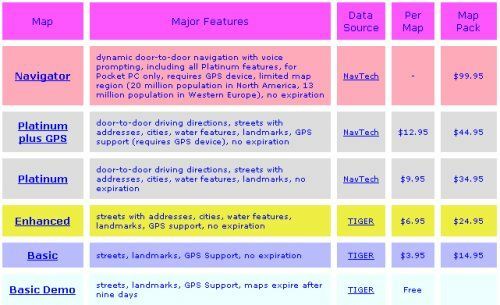 I think some GPS companies should take note of what Mapopolis has achieved. Great thought and design has gone into the product and many companies could learn from this. 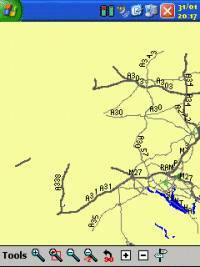 Within Navigator Mapopolis have added a plethora of features. 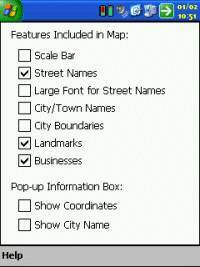 Under Map Features you'll find options like Scale Bar to display a bar on the map, the ability to switch on and off Street Names, ability to change the font from small to large on street names to make it easier to read on-map, the option to also allow for City/Town Names and Boundaries to be listed on the maps, and to also include features like Landmarks and Businesses. You can also within this menu show Coordinates on screen and the City Name. 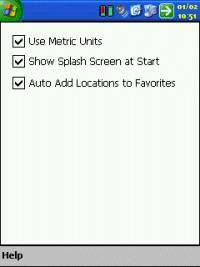 Under Program Options you'll find options like being able to set units to metric, showing the splash screen which gives access to the online help within the program, and to be able to automatically add locations to the favourite menus which is good because when you have visited a location, you won't have to manually bookmark it to drive to it again. 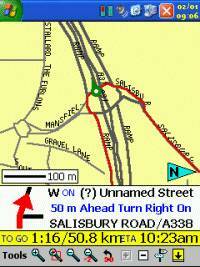 Under the GPS Options you'll see feaetures like disable Auto Power Off which really is essential when using navigation products, because if you don't have this feature selectable, the first thing you'll find when visiting a petrol station is when you come back to the car that the Pocket PC has turned itself off, and this can be quite frustrating, thankfully Mapopolis has added this feature into their product unlike some of the top GPS products! You also have the ability to have the map auto scroll and to auto-rotate, or you can have these set to manual (perhaps better for walking), the ability to have audio alerts above a set speed which can be used as a speed deterent and to automatically detect the COM port. You're starting to get the idea that Mapopolis Navigator really has been a thought through product and not just created quickly. 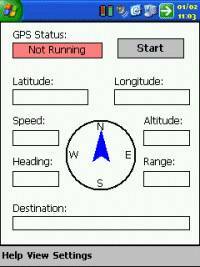 Like with many GPS routing products you also have the option to set the Fastest or Shortest routes. One thing I think Mapopolis excels with is they actually allow you to set the audio prompts up, not only what volume can be achieved (1-5), but also at what intervals Mapopolis will alert you at both from Start (before turn) and at regular intervals. 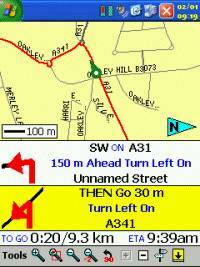 The Navigator screen when directions appear will split between directional information and map, Mapopolis also allows you to configure how large the directional information is on screen, either in small format, or large format, and to turn it on and off. 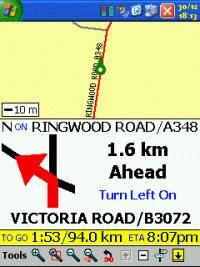 Something that most GPS Users request time and time again is Estimated Time of Arrival information, and Mapopolis adds this support to Navigator. 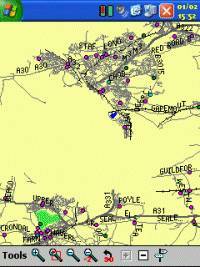 You can also change even the smallest of aspect of the mapping by changing colours of the background, parks, water, streets, major roads, you name it, you can set the colour, being able to fully customise map colours and utility information is truly remarkable! Mapopolis also supports full hardware button mapping for most of the most commonly used features like Zoom In and Out, Favourites, etc. Mapopolis have gone to great lengths and put thought into every single feature within their product, and this really does show, and you can see why a lot of American's like the product coupled with it's low price, really gives value for money. We've seen a shift over the past year of going from GPS Navigation programs that allow you to enter your start and destination locations, to a I'm here option, now plot my destination. The latter is something that most people prefer, but you do still sometimes what the ability of setting a From and To location, and Mapopolis have added both to Navigator. Something that is clear is Mapopolis are not forcing their ideas onto you, they're letting you make the decision which I think is how software should be written. 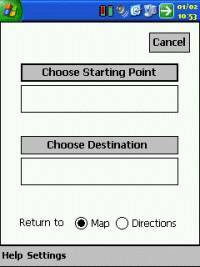 When you go to choose your Starting Point or Destination a menu will popup allowing you full select ability on how to plan your route. Not only do you have the option of entering an address, landmark or intersection, but to also select a contact from your Pocket Outlook Database, and also to be able to Find an area on the Map or even use your current GPS Position which is great if you don't know where you currently are! You'll also see below the section line the full address of each location you have recently visited (as a favourite), this allows for quick navigation in the future, and is great if you're using GPS just between your home and place of work. Once you've turned on the GPS Driver in the GPS screen, set your Starting Point and Destination, you can then start driving the map. The route that Mapopolis Navigator chooses is highlighted in red, when approaching the next turn, you'll be greeted by one or two directional information screens. In all of the tests we threw at Mapopolis Navigator, it always took us to the destination, although sometimes in strange routes. Mapopolis seems to have more of a priority to Major A roads rather than Minor A roads or B or C roads. 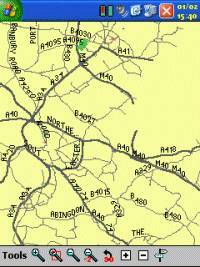 This results in sometimes Mapopolis taking you out of your way, sometimes a few miles in the opposite direction to join a Major A road or Motorway. Once joined it will take you to your destination, but sometimes you wonder if you should be putting your faith into the routing of the product. 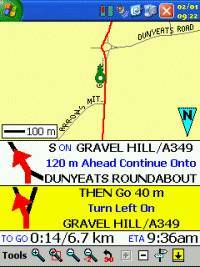 Going back 4 or 5 years ago prior to using GPS Navigational products, I would welcome this feature, as I always preferred when map reading to stick to the Major routes, and I would loath the time when I found myself driving through the centre of a city knowing that map reading, navigating and driving at the same time would be difficult at best. Since I've had the pleasure of using many of the top GPS Navigational programs I've come to put my faith in these more, and I now prefer to be routed through a town centre if it's going to really be the quickest route. You can switch Mapopolis to a shortest route scenario for routing, however some of the quickest routes that have been planned really aren't the quickest route when you take into consideration you sometimes have to travel up to 10 miles in the opposite direction of where you're destination is to join a Major A road. This can be a little frustrating, and I hope Mapopolis will fine tune it's routing scenario's to remove Major road routing. 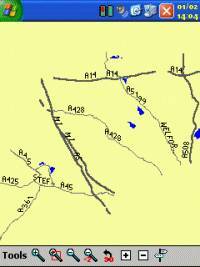 Where available within the map data you can route to house numbers on various roads and streets. This makes planning your route all the more easier giving you reliable departures and destinations. One good feature I like when driving using Mapopolis is that when you take a turn successfully you'll get a little high pitched chime to alert you that you've made the correct turn. When you make a bad turn, or go against Mapopolis instructions you will get a low long beep that signifies you've made an error. 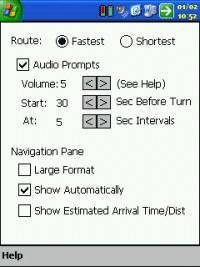 This can be very useful when driving as you're not always able to look at the Pocket PC screen, or sometimes when you have other passengers in car or the radio on, some voice commands can get mingled with other noises, so this helps to re-assure you that you've either made the correct turn, or failed to make the turn. 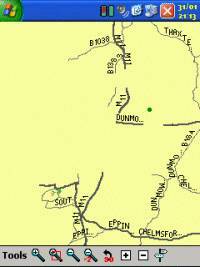 Unfortunately I found myself having to study the map and look for the red highlights on the road to determine which exit I should be taking. One thing that we've found Mapopolis does excel on is Points of Interest. The POI data is part of the maps. Although like all the GPS products offering Points of Interest, we're still no where near the complete POI that you'd find in a town, POI is getting better, and it's nice to see this increasing in every new product that hits the market. 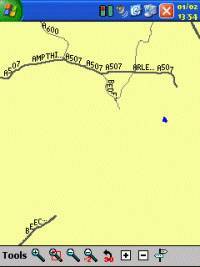 The Points Of Interest in Mapopolis will give you the name of the Point Of Interest and the road or street name that it's on. parks which are identified by tree's or green areas. 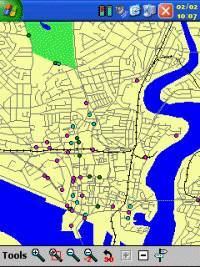 All of these allow you to pull together and use a comprehensive POI database. Another thing I've always wanted to see is a nice clean and detailed map. One thing that Mapopolis Navigator provides is this, just take a look at the screenshot on the left. 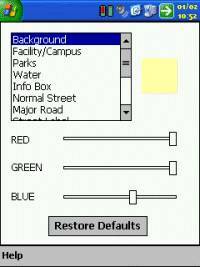 This is a screenshot of Southampton City Centre. 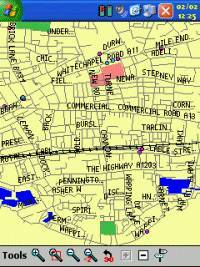 Above is a screenshot of East Central London. The amount of detail provided in both these maps, but especially the left hand map is very impressive! 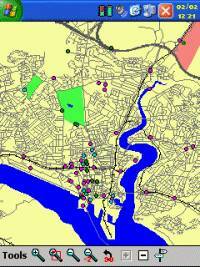 Looking at the Southampton City Centre map, I can make out the Common (top left), the major rail routes into the city, bridges crossing the inlets and you still get to see the Points of Interest within the City. 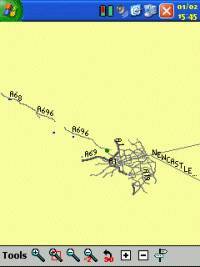 One problem we have experienced within Navigator is the map data for the UK. 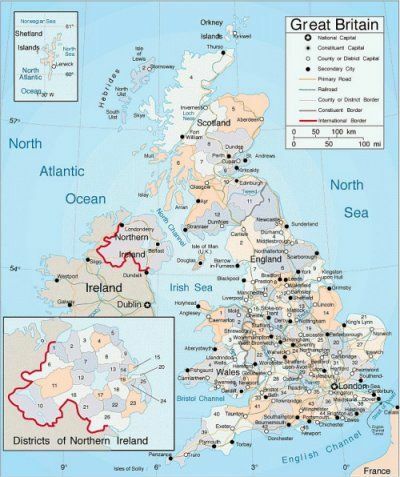 From talking to various people in the US, maps are very accurate, however in the UK it's a different story. Mapopolis are using NavTech as their geodata provider as do other mapping companies like PowerLOC and Navman. I've spoken with Mapopolis and they are fully aware of these map problems where huge chunks of map data are missing from quite a number of maps. Mapopolis are currently working with NavTech to resolve these issues. Q. What will happen if you approach an area of map that has vanished? A. You will be routed around this anomaly, unfortunately depending on the diameter of this anomaly, you may find that you are taken 20 to 30 miles out of your way to route around this. You can drive through the anomaly, but you will lose all map data and routing until you come out the other side where routing will resume as normal. 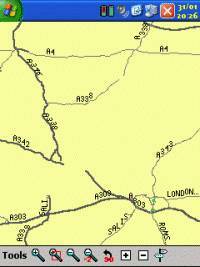 Some of the mapping problems are only minor with losing a fraction of a mile of road like in the first screenshot below on both the A40 and A361, but this can be increased up to two and a half miles, or even a much larger scale as seen in the third screenshot. 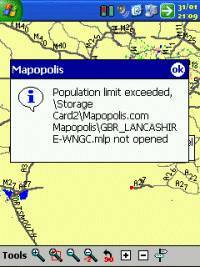 One other problem that we were faced with Mapopolis Navigator, although the county maps are provided in a single Country download for England, Wales, Scotland or Northern Island, there are problems if you wanted to say load the complete UK maps into memory. This problem exists when you either select all the maps individually on the Choose Map screen, or if you open one map and request to open up all contiguous maps. Population Exceeded error for each map that it cannot add which can be a little frustrating. 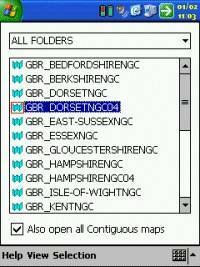 Are there any features not present in Mapopolis Navigator ? The ability to be able to set a profile against various colours enabling for day and night colours as most people find Pocket PC's too bright for night driving and like to inverse whites with blacks. Currently no SDK is available for third party developers to be able to add Speed Camera databases and other POI warning systems. Mapopolis Navigator and maps has great potential. 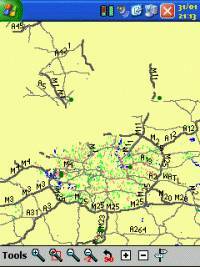 Most of the features you're looking for in a street navigation system is present within Mapopolis. Overall the product scores highly, however some things need to be modified for the UK and European market like routing around roundabouts, and the ability to take into consideration routing across towns as quicker compared to going 10 miles out of the way to join a major road. One thing unfortunately Mapopolis falls back on largely is the quality of the maps available for download. 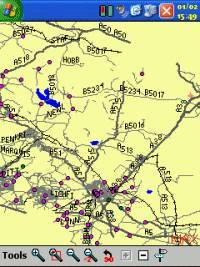 Many of the county maps have roads that suddenly disappear, huge areas of map data are missing in others, and this will hinder the product in a UK market unless these are quickly rectified. 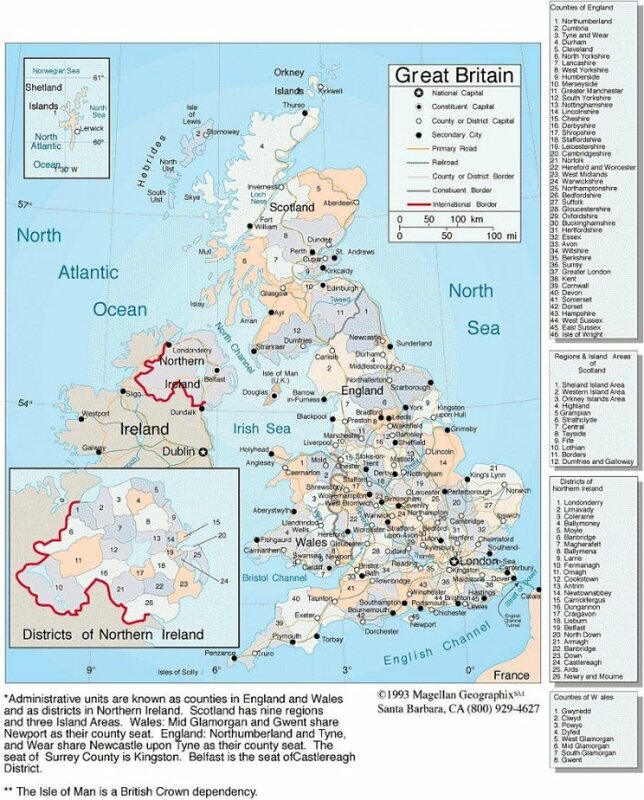 With this in mind we do think it should be appropriate for Mapopolis to put a statement on their website regarding the problems with the UK maps otherwise this could add even further rejection to the product if people purchase maps and are unhappy with them. 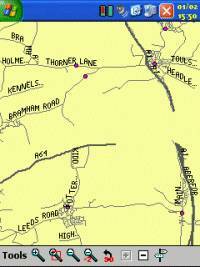 On the other hand we have already received reports from Mapopolis UK customers who have been unhappy but have been given grace periods of 30 days to review the maps and offered a full money back guarantee providing no more than 5 maps are downloaded when purchasing the complete England maps. Mapopolis are trying to help their customers which is more to be said for other GPS companies, and we do thank them for doing the right thing here. **Unfortunately due to the expanse of these map problems we have had to down rate this review as although on two of the maps used we had only one issue with roads disappearing, it's unfair to give the review full marks because of what other Mapopolis customers will experience in the UK. With this in mind, we would welcome Mapopolis contacting UK users and Pocket GPS once these map problems have been eliminated and we will re-review the maps and adjust our review accordingly to re-instate full marks.